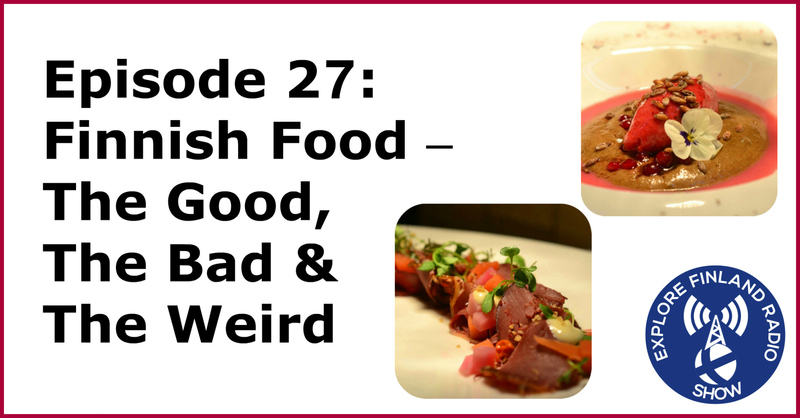 In this episode, first of all, Miia and I talk about some of the myths about Finnish food. It’s not all pickled herring here in Finland, it’s rather more ordinary; pork, chicken and beef. Miia, being a Farmer’s daughter, is the ideal person to explain how basic, everyday food has changed in Finland. Like many countries, globalisation has brought a wider variety of everything, especially fruit & vegetables. We then talk about some of the more unusual Finnish food, you’ll hear us talking about Mämmi, Salmiakki and voileippakakku (translations below, explanations n the podcast!) Miia also tells about the hard rye bread,traditionally stored on poles across the ceiling, in days of old. Somehow we managed to overlook the subject of reindeer, although as non-Finns find the idea of Rudolph-flavoured pizza, maybe that’s for the best! Miia then takes me behind the scenes of Ravintola Juurella, the restaurant she co-owns in Seinäjoki. Miia explains the atmosphere they are aiming to create. The menu consists of locally sourced produce, cooked to produce ‘honest’ flavours, but presented artistically. This has earned Juurella it’s position at the head of the fine-dining restaurants in the area. What’s on Today’s Menu Miia? Finally, we discuss traditional Xmas food; roasted pork, several ‘laatikko’ dishes, various salads and smoked or salted fish. It’s got me looking forward to Xmas Eve already but, until then, I guess we’ll all have to make do with my previous blog post about my family Xmas Eve. Maksa-, peruna-, ja lanttulaatikko by Ville Oksanen – http:__www.flickr.com_photos_villoks_331397520_. Kiisseli – Berry based concoctions somewhere between juice, jam & soup! Voileipäkakku – Lit. Butter bread cake. A savoury cake made with bread, cream, salmon and salad vegetables. Usually served in family parties. Laatikko – Lit. tray or box. In this context a dish that is pureed and baked in an oven dish. Rosolli – Salad made from beetroot, onion, apple carrots and whipped cream. Jälkiuunileipä – Lit. After Oven Bread. A hard, rye bread that was traditionally baked for 2-3 hours in an oven that is starting to cool. ← Finnish Football Show #2 – Where Next for Huuhkajat?